36 September 2016 | beautystorebusiness.com that I had a long and detailed history in knowing what clients preferred, and more importantly, what was missing from the market," she says. "Being an artist definitely helped me develop a product I can trust and allowed me to create something that was unique. The industry was missing a foundation that was universal for all skin types and tones, and artists, including myself, had to tug around various series of products that addressed clients' individual needs." Once she had an understanding of what she was looking for, the long road to creating it and trying different for- mulations began. "The formula took me a while to create because I wanted it perfect. I wanted it to be exactly what I envisioned and what was missing from the market. I wanted one formula to work for those with dry skin and oily skin, those with flawless complexions, those who suffer from rosacea or acne and even dif- ferent age groups, including women from 18 to 80 years of age," Caradanian says. With her image and name so heavily associated with her own brand, extra pressure was on Caradanian to achieve a formula that she could stand by and feel proud selling to consumers. She's a believer that her product stands out in a sea of available cosmetics, and realized that as a business owner, she needed to be a fan of her own products if she expected others to follow suit. "It's easy to create something that exists, and even easier to put your name on a product; but it takes time and dedication and months at the lab to create a product that changes the game. I firmly believe the formulation of the Micro Silque Founda- tion was a game changer in 2015, and was actually named Jaclyn Hill's favorite foundation of the year. When you have the world's biggest YouTuber saying your formula is the best she used that year, you know you made a difference," she says. As "icing on the cake" to her brand achieving success and acclaim by many notable beauty bloggers, Elcie Cosmet- ics also had the honor of receiving a Cosmopolitan beauty award in 2016 for having a formula that needs #NoFilter. "As it provides HD-level coverage, the ELCIE ESSENTIALS Lilit Caradanian gives you a product breakdo n of Elcie Cosmetics' bestselling skin staples. Micro Silque Foundation: "I need my flawless skin every day! Even if I have no eye makeup on, I need my skin right," Caradanian says. The award-winning Micro Silque Foundation is what her company is known for, and it's her personal go-to product. Lightweight, yet buildable, it provides HD coverage— for every skin type. For long-lasting wear and water-resistant strength, this silky foundation provides a flawless complexion and is available in 12 shades. Suggested retail price: $45 elciecosmetics.com The Glo Enhancer: "I always wanted to create products that offer that highly desired glow and make it achievable for all skin types," she says. "I wanted this product to make one's skin glisten without the look of caking on highlighters. And this product, in particular, allows the skin to glow, while providing actual long-term skin benefits, such as antiaging, oil control and [an infusion of antioxidants to the skin]. The Glow Enhancer is the start of our 'Skin Enhancers' series, and we have a few more products that will be just as easy to use and fundamental to one's beauty routine." SRP: $48 elciecosmetics.com Micr o day! E Ca ra is w pr o fo s The Glo offer skin ski An w En hancer Images courtesy of Elcie Cosmetics Foaming Mousse An alcohol free, pH-balanced and weightless mousse that adds volume and body to flat hair, while producing a vibrant shine. Our mousse is humidity-resistant and flows through an environmentally-friendly aerating pump. It is also a thermal protectant. 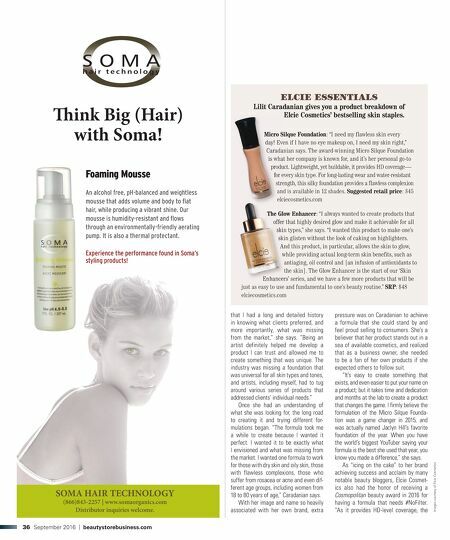 Experience the performance found in Soma's styling products! 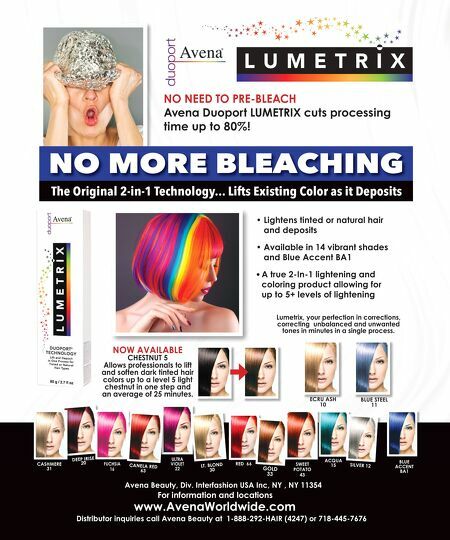 SOMA HAIR TECHNOLOGY (866)843-2257 | www.somaorganics.com Distributor inquiries welcome. ink Big (Hair) with Soma!